Serene Conneeley is an Australian writer and healer, the author of Seven Sacred Sites, A Magical Journey, Witchy Magic, Mermaid Magic and The Book of Faery Magic, and creator of the meditation CD Sacred Journey. I picked this up in a special promotion a week ago, along with the two other books in the author's 'Into The Mists' trilogy. This is book 1. I had no real expectations before reading this book, as faeries and magic (and dovetailing those with YA) isn't something I'd normally select, but I was keen to read this author as she's someone I've known personally and recently reconnected with, and these days we've discovered mutual friends through our writing. 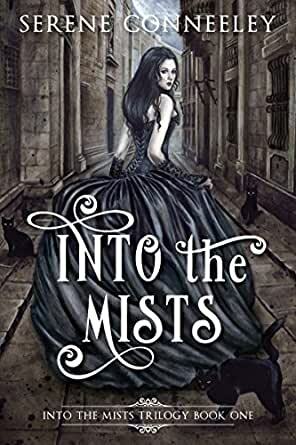 My favourite aspect of Into The Mists ended up being the faery stuff: black cats and mists, magic books and spells, cottages with ghostly candles, and all things that go bump in the night. I really enjoyed the discussion of 'cards' and the descriptions of what the individual cards mean and how they interweave with the person selecting those cards. If it's possible, those were the sections where I really 'felt' the magic. I truy enjoyed this story, it gets you in & takes you away to the UK, into the mists! You won't regret reading it, I just home Serene writes book 2! This was a fascinating tale of growth and self discovery. A story of a 17 year old, who lost her parents, blamed herself, and was then thrown into the world of a grandmother she never knew existed. To top it off, her grandmother was nothing she expected, and her new home, in a new country, was one of magic and witchcraft. This story took me on a spiritual adventure, where the characters learned truths about themselves and each other, learned to forgive, and learned to love. It was unlike anything I've read before. I especially loved the breakdown at the end that explained the religious tones of the story. As a born baptist, I was born with very ignorant views of paganism and witch lore, but I have grown to love the fantasy world, and always wondered about the true spiritual beliefs. Serene Conneeley helped me to understand the religion, and gave me an appreciation and respect for those that follow it. Thank you for helping me be a better, more accepting Christian. Into the Mists by Serene Conneeley is a 4 star read. Carlie wakes up in a hospital bed after a car accident that kills both her parents, feeling responsible as she was driving she’s left with a lot of anger that she takes out on the people closest to her, two weeks later she’s put on an airplane, sent half way across the world to live in England with a grandmother that she knew nothing about. As the days pass she starts to experience some weird and unexplained things which help help understand her mother better. This is an addictive story, although I felt it was too long winded at some parts I couldn’t put the book down until I’d finished it, this is book 1 in a trilogy. I voluntarily reviewed a gifted copy of this book. I really enjoyed this story over-all and recommend the story to you. However, I must admit that I absolutely hated the main character in the first eight or so chapters… Her attitude and actions were quite inexcusable and over the top... I kept telling myself, “Okay, I get it…BUT snap out of it!! !” Sort of reminded me of how today's youth think "It's all about ME!!" and their over-the-top sense of entitlement. I must say that I would have enjoyed the story even more if the first eight chapters had been condensed into one or two chapters! However..I’m SO glad I stuck with the story because starting with Chapter Nine, I became thoroughly hooked by the story and couldn’t put it down. There’s also a lot of very good advice in the latter part of the story that can be transferred to real-life situations as well. I voluntarily reviewed an Advance Reader Copy of this book. This is very emotional book, dealing with a month in the life of a teenager consumed by grief, guilt and anger after her parents' death. Although the chaos of her feelings is well conveyed, the beginning of the book is difficult to read. The beauty and numinous quality of the English landscape as well as the slow revealing of hidden truths through dreams and visions gradually heal her. I do feel that if the spiritual background of the book had been Christian instead of pagan, with the "messenger faery" being an angel, many readers would find it overly "preachy". Beliefs and rituals are described at length and everyone is almost too kind and understanding. However, I found the information genuinely interesting and the tone of the book warm, wise and gentle. I received an advance reading copy and this is my voluntary review.